A very cool, and often gross, suspense movie. This movie is pretty great. It is dark and intense in all the right places. this is the story of a group of scientists at a research center in the arctic who are cut off from the rest of the world and have an alien creature living among them. This creature is a mystery and takes the form of some of the different members of the research team. The coolest thing is watching the creature transform in all of it’s gory and grotesque fashion. There is a lot of paranoia and edge of your seat suspense to this movie, and unfortunately it doesn’t hold up the whole way through. The ending is not on the same level as the rest of the movie, but it’s still a great film. 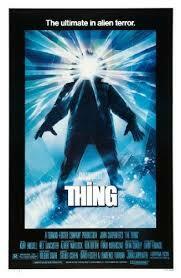 The Thing is a movie that does everything right up until its end. It is a near perfect movie. The problem is that the end of the film is a huge let down. Still, for 90 percent of it, this was riveting, edge of your seat stuff. That is because this movie goes for the unique combination of horror / sci-fi / suspense / and mystery. It is about a research station in the arctic, where an alien creature has infiltrated the crew. The problem is that this creature can make itself look like other people and so nobody knows whom they can trust. Now all of that sounds like the spider man villain, the chameleon, or some other silly concept where a person can just change his face. Think mystique in the X-Men movies. If it were as simple as that, this movie would not be half as good. The reason why it does work is because it tries to offer scientific explanation for what is going on and has characters dissect alien creatures to understand the workings of the whole thing. We get visuals to see how the metamorphosis of this creature happens. What works is that the alien does not just become another person at the snap of a finger, but instead, must absorb the other person, attach it to him, and slowly start to change. On more than one occasion, the alien is caught while it is in the process of changing, and not yet fully formed. All of this becomes gross at times (we see creatures without any skin, and also watch a doctor stick his hands inside a dead alien carcass and pull out organs,) but it is also very cool. The detailed creature effects really go a long way to convincing us that this is something to be taken seriously. It rather reminds me of the Jeff Goldblum movie, The Fly, in that way. The storyline begins when a research team from another center nearby sends a helicopter pilot to the camp of our heroes. The pilot gets out and starts shooting at a dog. This dog is the pet of one of the men at the camp, and another man in the group grabs his gun and fires on the helicopter pilot, killing him. I thought maybe this was the setup for a mystery, and that if we were smart, we should be wondering about, and remembering that this man shot the pilot. Especially when the dog that the pilot was chasing turned out to be an alien. I thought that maybe the guy who shot him was an alien too, trying to protect the dog, and that is why he was shot the helicopter pilot who was trying to kill the alien dog. As it happens, this movie does not get nearly that elaborate, and that is a shame. The mystery is the weakest part of the story, because it really does not have any clear solution or final answer. Instead, we have to appreciate this movie for what it does have, which is a hell of a lot of ambition and fear and suspense. There are a lot of carefully structured setup scenes here, where we see things that don’t look right, but aren’t exactly sure of why. Legendary director John Carpenter made the movie, and it is absolutely one of his best films. With this one, he is really taking his time to get things right, the way Hitchcock would have, if he made a movie like this. 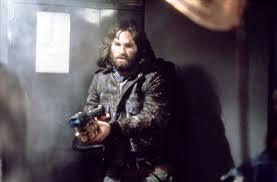 Kurt Russell (carpenters escape from new York star) is the protagonist in this movie, playing raj. Macready. Everyone just calls him Mac, and the cool thing is, he is barely the star. This is an ensemble movie if ever there was one, where we really get to know the characters and exactly who is on the team. Now that does not mean flashbacks to their lives, or anything before they arrived at the camp. This movie does not have time to waste on extra information like that, and it is a good thing. There is just too much happening in front of us to be sidetracked with the past. The fun gets started somewhat quickly as the dog is locked in a cage with a bunch of other dogs, and suddenly attacks them. I like that the people at the station catch wind of this and get to see it happening, instead of the way most movies do it, where the people are kept in the dark until about halfway through the film. In this one, our heroes are smart and on top of things, and they get involved right away. Only what they do not realize is that the alien can change forms and can really be any one of them. Paul Verhoven made a movie called Screamers, about a decade ago, and it was very similar to this film. There was not a camp of guys or anything, but the alien who could be any one of them was definitely a key concept. In the thing, it works even better because of the camp and the seclusion away from the rest of society. These guys are trapped at this facility whether they like it or not. We get some of the usual moments you would expect, like watching as the guys turn on each other, and each suspects everyone around them. Luckily, the movie does not overplay this and limits it to only a few scenes. It is too busy with the cool visuals of the alien. For each new person or creature that the alien becomes, we get to see it in a different way. That is a smart movie, keeping us always interested and wanting to see more. The final scenes of the movie are not as good as anything that came before it, simply because they offer no real answers or explanations or even mystery reveals. They rather remind me of the end of species, another alien movie. The thing is great up until this point. The actors bring the scared energy to life and you really feel the suspense and horror around every corner. This movie might have a somewhat simple and straightforward plot, but that is okay, because it is put together so carefully and made so well. Carpenter really shows that he is a master of style with this film, as he keeps us on the edge of our seat through nearly the entire picture.